The ferocious US winter of 2014 has undoubtedly demonstrated the economic viability of telework. In many parts of the country, home broadband connections, VPNs, and cloud-based applications allowed numerous workers to continue working when heavy snows prevented them from getting to the office. 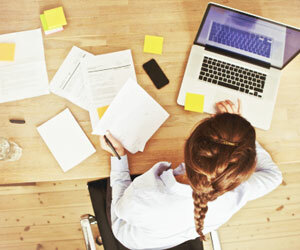 In fact, telework is becoming not only an option on snow days, but a common practice among employers across the globe. In the United States alone, telework arrangements have grown by more than 63% since 2006, according to market research company Global Workplace Analytics. Major corporations like British Telecom and Dow Chemical report that teleworkers are up to 40% more productive than their in-office counterparts. The American Management Association says organizations that implemented telework programs realized a 63% drop in unscheduled absences. And IBM reports that telework allowances have slashed $50 million from real estate costs, since more employees working from home reduces the amount of office space needed. But telework technology doesn’t guarantee productivity from every off-site employee. A recent study has found an apparent link between certain personality traits and teleworker “cyberslacking”— a term used to describe the practice of using the Internet for non-work purposes while on company time. For some people, a telework option is an invitation to waste business hours watching YouTube videos and shopping on Amazon; no colleagues or supervisors are around to notice. A team of researchers led by psychological scientist Thomas O’Neill, University of Calgary, decided to examine the personality attributes that lead some people to cyberslack while prompting others to actually maximize their output. They looked at such personality variables as agreeableness, conscientiousness, neuroticism, honesty, and procrastination. O’Neill and colleagues convinced two organizations — a financial services corporation and a staffing and recruiting firm — to administer employee surveys designed to measure personality traits, self-perceptions of performance, and satisfaction with their work-at-home arrangements. The employees were also asked about their levels of distraction — including the temptation to leisurely surf the Internet — when working remotely. As they had predicted, the researchers found that workers who scored high on measures of conscientiousness, honesty, and satisfaction with remote work were less likely to report cyberslacking behavior. Conversely, workers scoring high on procrastination and low on satisfaction were more prone to cyberslacking. “Procrastination was the most important trait, suggesting that a motive of cyberslacking may be to put off work and explore other interests (e.g., read the news) rather than take a needed break that restores and energy and focus,” the scientists report in the journal Computers and Human Behavior. The researchers had predicted that people high on neuroticism would have difficulties concentrating and avoiding distractions, making them more prone to cyberslacking. But to their surprise, they found no connection between neuroticism and cyberslacking tendencies. O’Neill and his team suggest that the findings are a starting point for identifying personality traits that explain individual differences in on-the-job behavior among teleworkers. They suggest that unsatisfied teleworkers may view cyberslacking as a way to pass time or search for a new job, while underperforming employees may be looking for an escape from exerting effort or from experiencing feelings of low self-efficacy. But the researchers cited the need for larger studies involving multiple organizations, with more exploration on the personal motives and justifications for cyberslacking. Such research, they say, could prove highly useful for organizations in identifying employees who are most suitable for telework. So why doesn’t personality research do more on changing personality habits – instead of painting people into a corner with them! Isn’t it about time there was a change in the focus of personality research? After all, there is significant research showing that flexibility of personality has real benefits during the lifespan.